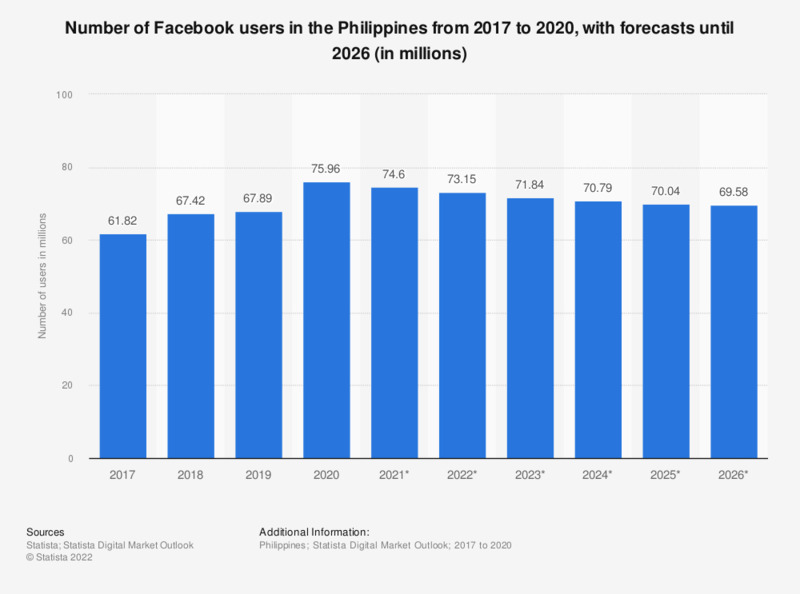 This statistic shows the number of Facebook users in the Philippines from 2017 to 2023. In 2023, the amount of Facebook users in the Philippines was expected to reach 49.9 million, up from 41.2 million in 2016. With more than 2 billion monthly active users, Facebook is the most popular social network worldwide. Popular activities on the social network include watching videos, liking content via button, reading articles and messaging friends on 1-1 basis. In July 2016, Facebook Messenger surpassed one billion monthly active users, placing it directly next to Facebook-owned competitor WhatsApp. Facebook successfully managed the transition from social network to mobile social platform, nearing one billion monthly active users and with mobile accounting for 77 percent of the social network’s total advertising revenue in 2015. Mobile is also the keyword regarding the online market in the Philippines; in 2014, 41.28 million people accessed the internet through their mobile phone. In 2021, this figure is projected to amount to 66.64 million mobile phone internet users. As of July 2016, the internet penetration among the population in the Philippines was 43.5 percent. A total of 47 million users access social media via mobile on a monthly basis, making the country the second-largest Facebook market in the Southeast Asian region. The average internet connection speed in the Philippines is 3.5 Mbps, less than an eighth of market leader’s, South Korea’s, average speed of 29 Mbps. The Philippines also ranked second in terms of internet freedom in Asia according to the Freedom House Index in 2015.